If there is one word to describe the future of Android based on what we've seen at Google I/O so far, it would be "context." Google is working hard to make Android and Android apps understand where you are and what you are doing. An example we pointed out yesterday was when asking Google on a Friday night "What's playing?," the app returned movie times. On another night, Google might have figured that you were seeking television listings. Google's developer website posted information about the Awareness API, which developers can use to make their apps contextually aware. 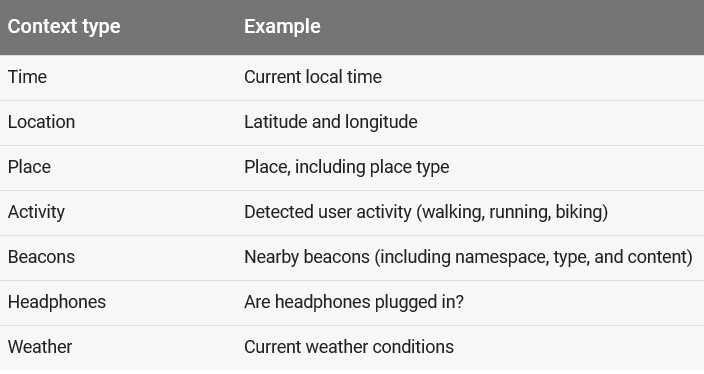 There are seven different types of context including Time, Location, Place, Activity (walking, running or biking), Beacons, Headphones and Weather. With the Awreness API, an app could automatically open Spotify when the headphones are plugged in. The API also manages how it is affecting battery life and data usage. This way, the developer doesn't have to worry about writing such features into his/her app. There are two APIs that are found in the Awareness API. Fence API lets a developer's app respond to current situations and notes when a pair of context conditions are met. For example,a developer can request, "tell me whenever the user is walking and their headphones are plugged in." Once the two conditions are met, a callback is sent to the developer's app even if it is not open. Snapshot API allows a developer's app to request contextual information from the API. The example given by Google is "give me the user's current location and the current weather conditions." Think about a future where someone who takes a lot of photos with his phone, finds his/her camera automatically opening as soon as he/she gets outside. Meanwhile, someone in the same household with the same phone who isn't an avid photographer, might go outside only to see the camera app remain closed. It's called context, boys and girls. And if you're an Android user, get ready to see plenty of it in the future. Well this certainly won't be creepy. Nope, not at all. It's no different than apps like Tasker that turns features on and off dependent on your location, like WiFi or mobile data. When I started there were apps that would let you know about certain businesses in your current location. Motorola changed how your phone works when say you start driving, or when you're at home or at work. You don't have to use those features, but it definitely makes things much easier. You can turn it off, just like Google Now. Goosebumps on me already. Like this guy who keeps on saying his body is ready, I bet I long to see this kind of interaction. Will it be able to tell if I've been taken by Nazis? Well if you were timenapped by Nazi's the Internet, GPS and Google wouldn't exist so… No. But maybe all that amazing technology in your hand would keep you alive... Or maybe you would inadvertently help the Nazis take over the world. Eh. Equally good chances. Similar to Tasker. Superb app. Could Google apply that to Waze? Each time I've tried to amplify the map Waze acts as if I'm waving my hand and launches a voice assistant that I don't want. Btw it hasn't learned my habitual route either, and keeps suggesting a slower and slightly longer route. This leads me to think I whip out the headset, and the example app launches Spotify, but I want to make a call, and it won't change no matter what, so in the end either turn off the feature, or uninstall the app. Will it become aware of my wife and close my gallery and chat apps immediately? No, but it'll launch chrome in incognito mode and lower the volume when you go to the bathroom. AutomateIt Pro already makes use of the first 5 on my OnePlus One for automating system settings/configurations. SoundAbout already makes use of the 6th to block notifications from making sound over the speaker when a headphone is plugged in/connected via Bluetooth, and PowerAmp uses it to resume music when my headphones are connected.